We cannot completeour journey to salvation in heaven unless we make another stop. This time, we stop at water. Do sinners have to be baptized? You probably know people who do not believe that a person must be immersed in order to go to heaven. 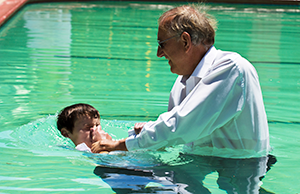 What does baptism do for someone? Notice what the Bible says. Just before Jesus went back into heaven, He told His apostles to preach the Gospel to people of every nation. When the apostles preached, they were to tell people to be baptized into the name of the Father, the Son, and the Holy Spirit (Matthew 28:18-20). When the apostle Peter preached on the first Day of Pentecost after the Lord was resurrected, members of his audience realized that they had broken God’s law. They asked what they needed to do, and Peter did exactly what Jesus told him to do. Peter told them to repent and be baptized for the remission—the forgiveness—of their sins (Acts 2:38). People cannot go to heaven unless they have been forgiven of their sins (Colossians 1:14). 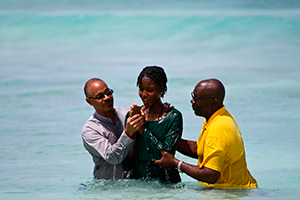 Sinners are baptized so that their sins can be washed away by the blood of Jesus (Acts 22:16). Have we finished obeying the Lord when we are baptized? Not completely. When we are baptized, we start our new journey as Christians, having made a commitment to serve God for the rest of our lives. We must continue to serve Him every day, living as Christ wants us to live, and not as the devil wants us to live. If we say that we are Christians, but do not live as Jesus wants us to live, we are not really Christians (1 John 1:6). Jesus said that we will go to heaven—if we are faithful until we die (Revelation 2:10). Being faithful means that God can depend on us to obey Him, and that our brothers and sisters in Christ know for sure that we are doing our best to go to heaven (James 1:21-22). Can God depend on you to be faithful until you die?